LuxDerma Reviews: Would You Recommend This Product To Your Friends? 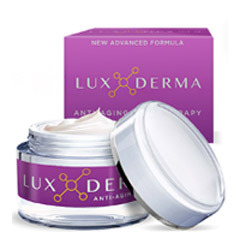 LuxDerma, US $89.16 excluding shipping and handling fees, is an anti-aging cream that is exclusively available online by signing up for a free trial offer. Hyaluronic Acid: Attracts moisture to rest on the surface of the skin, as it also helps restore your skin’s healthy, spongelike qualities in capturing and storing moisture to keep your skin from drying over longer periods of time. LuxDerma must be used as part of your morning and evening skin care routines, applying the product only following a fresh cleansing and toning. Always layer with sunscreen in the morning as some ingredients may cause your skin to become more reactive and, therefore, become more easily damaged with sun exposure. This product is made only of ingredients that are clinically proven to have anti-aging benefits, that is, according to affiliate marketing websites. This product is available via a limited time, free trial offer where you are charged only with shipping and handling fees for your first order. LuxDerma reviews that have good things to say about this product are mostly posted on affiliate marketing websites which makes reliability questionable due to a clear conflict of interest. There is no available information about this product’s manufacturer which makes it impossible to establish its track record in formulating skin care products, as well as its accountability for product results. The full product ingredients list has not been disclosed online. LuxDerma reviews posted by both users and critics alike have raised doubts about the terms and conditions of the free trial offer and the payment scheme where several users have already pointed out difficulties experienced in cancellations and reversal requests. LuxDerma is likely a basic moisturizing product that comes with a premium price tag. When you have US $100 to spend on skin care on a regular basis, you should check both product and manufacturer credibility which, as far as reviews go, this product clearly does not enjoy.